Doug Hall, managing editor of Rodale’s Organic Gardening magazine, shares some of his favorite vegetables to come out of the Rodale Institute test garden last year. ‘Brandywine’ tomato. “The hearty flavor of this old heirloom variety is everything you could ask for in a tomato — in fact, it won our office taste test last summer. But it’s slow to ripen and can be balky if the growing conditions aren’t just right,” Hall says. Seed source: Johnny’s Selected Seeds, 877-564-6697, johnnyseeds.com. ‘Beananza’ snap bean. “This is a space-saving bush bean with the summer-long stamina of vining beans; our harvest lasted about 10 weeks. It’s a stringless variety with a great beany taste,” Hall says. Seed source: Burpee, 800-888-1447, burpee.com. ‘Yaya’ carrot. “Carrot connoisseurs love the sweetness and reliable crunch of this stubby hybrid, which sizes up well even in clay soils,” Hall says. Seed source: John Scheepers Kitchen Garden Seeds, 860-567-6086, kitchengardenseeds.com. 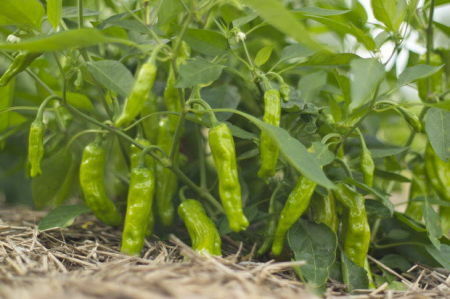 ‘Shishito’ pepper. “Saute them whole for a tasty appetizer or toss them on the grill — this thin-walled sweet pepper offers plenty of culinary options. The plants are amazingly prolific,” Hall says. Seed source: High Mowing Organic Seeds, 802-472-6174,highmowingseeds.com. ‘White Russian’ kale. “With leaves that are tender and mild, this is the kale for people who think they don’t like kale. It’s also a season-extender, producing from early spring until well after fall frosts,” Hall says. Seed source: The Natural Gardening Co., 707-766-9303, naturalgardening.com. via Organic Gardening’s five favorite veggies for your garden | lehighvalleylive.com. One Response to "Organic Gardening’s five favorite veggies for your garden"